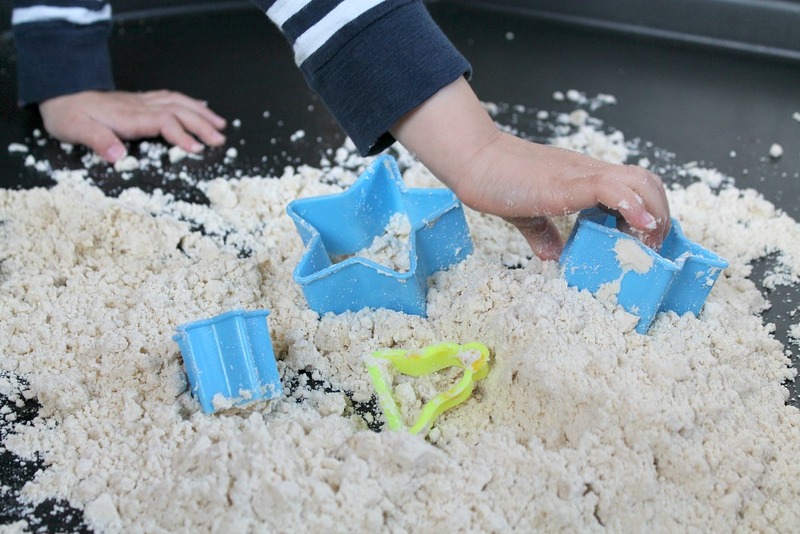 I've been trying to find messy play activities that I can set up quickly and that will keep my 3 year old and 1 year old happy on rainy days. 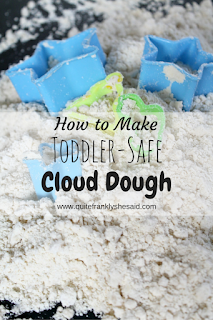 I'd heard of cloud dough before, having seen it at a local messy play group we go to. It's a simple oil and flour mix that is mouldable like wet sand but has a fairly dry consistency. J still likes to shove everything in his mouth so I needed a toddler-safe alternative. This version of cloud dough is made with edible ingredients so it's perfectly safe if he does decide to eat some! 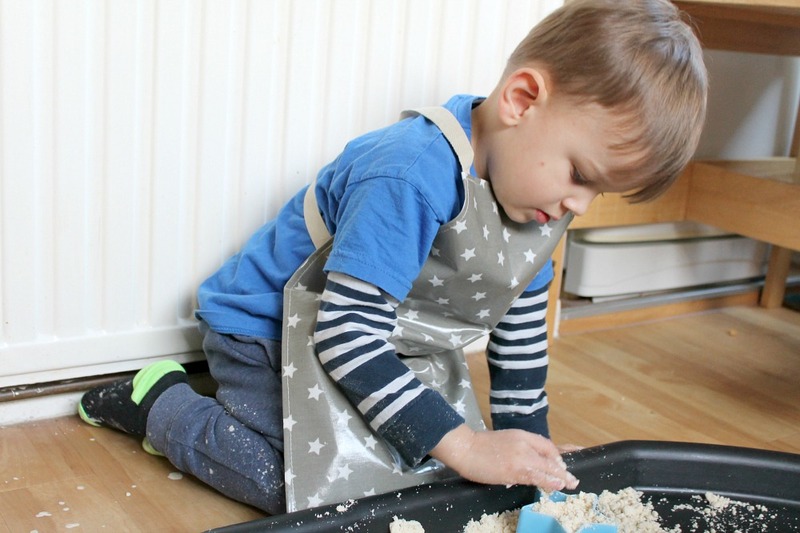 Little N has a lovely new Messy Apron from Messy Me to protect his clothes during our messy play sessions which we'll show you, too! 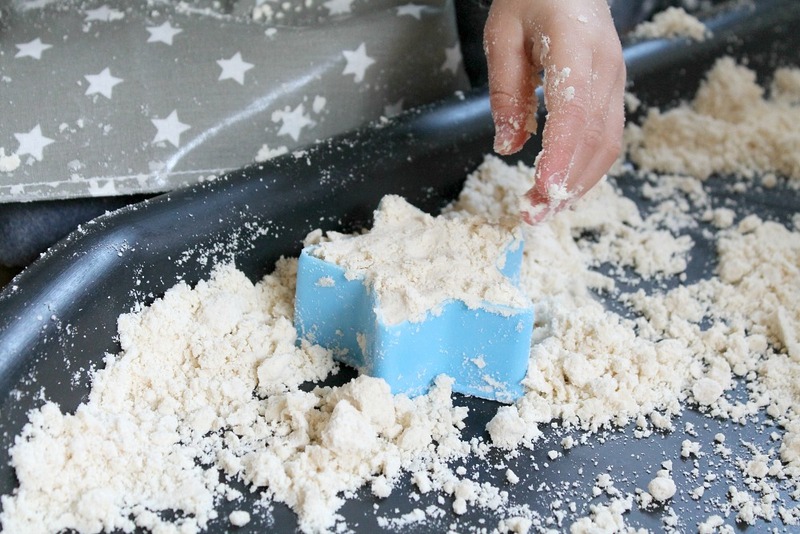 Cloud dough has a fluffy texture and can be shaped and moulded like wet sand. But it isn't sticky or oily even though it does contain oil. It's made with edible ingredients, so while it wouldn't be very nice to actually sit and eat, there's no need to worry if some does make its way into your child's mouth! 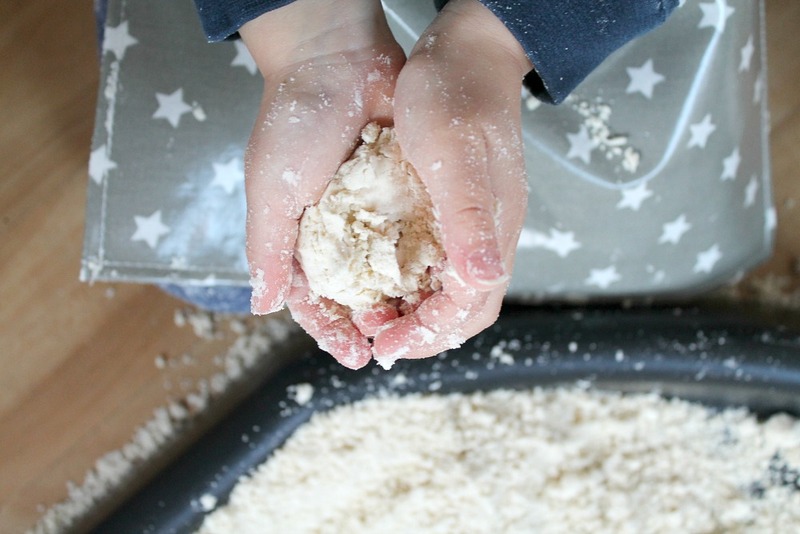 I use a ratio of 1:8 oil to flour and I set the boys' tuff tray up in the kitchen along with lots of utensils that they can use to play with the cloud dough. I put 1 cup of oil with 8 cups of flour in a large bowl and simply mix it all together. It's then ready to play with! 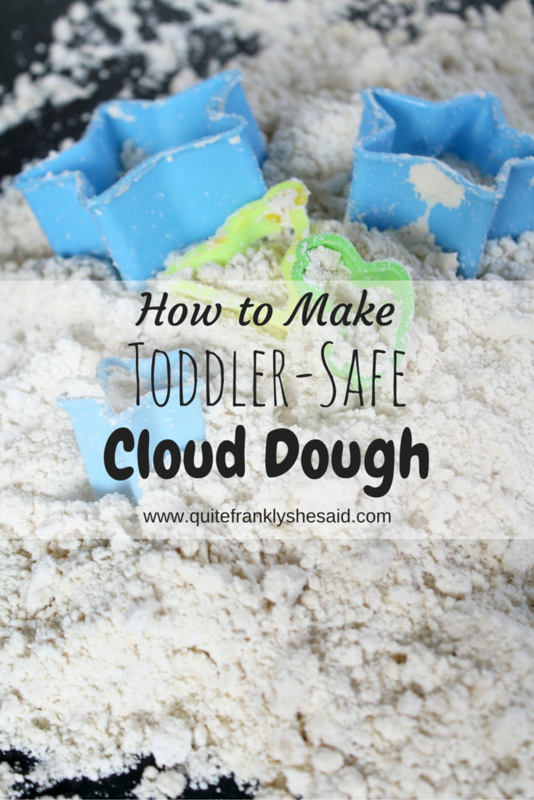 And if you use an airtight container or tub to store your cloud dough it will keep indefinitely. 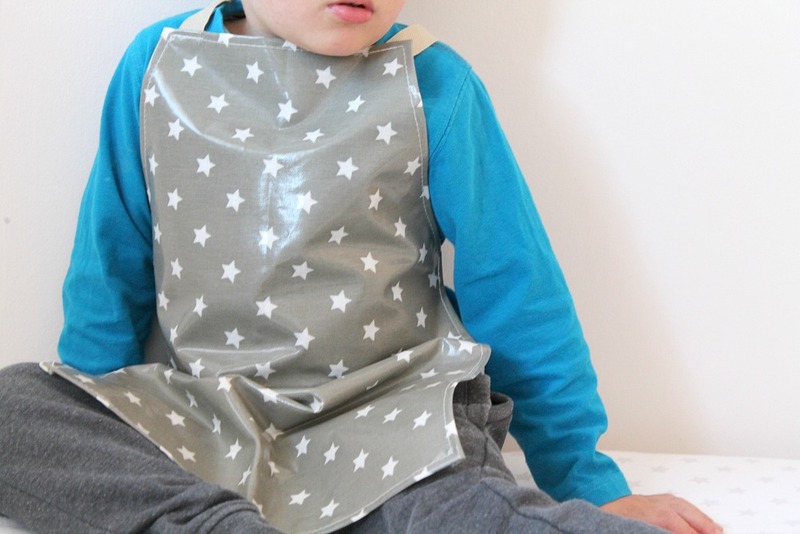 To keep Little N's clothes relatively mess-free, he has a gorgeous new Messy Apron from Messy Me. Messy Me is a British company creating practical and stylish products for little ones using Danish oilcloth. The products come in a range of lovely prints, such as the olive grey stars that Little N has. The oilcloth is wipe clean and can be machine-washed if needed after particularly messy adventures. The apron has soft cotton ties and fits Little N really well. He loves it and is so proud of it! We've not had to machine wash it yet as everything we've used it for - painting, sticking, cloud dough - has just wiped off without leaving any marks. It's designed to fit children aged approximately 3-5 years old so should last him through a few more years of messy fun! The Messy Apron is £14.00 and comes in five different prints. What rainy day activities do your children enjoy? I was sent a Messy Apron to review.